Quite a brilliant book. 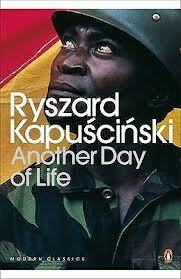 Kapuściński writes really well and completely engages you with his narrative. I learn’t a lot reading this. Irrespective of mistakes Kapuściński may have made in his support for the ‘regime’ in Poland, his books are a window into a different world. This is a cohesive snapshot of Angola (and Africa) changing from colonial to self rule. He may play hard and fast with personal facts but this doesn’t detract from the work. This entry was tagged Kapuściński; Ryszard. Bookmark the permalink.